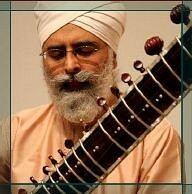 Dharambir Singh MA, FTCL, NESTA Fellow and MBE is one of the most prominent Sitar players based in England. Disciple of the legendary Sitar maestro Ustad Vilayat Khan. Dharambir has truly imbibed the sound of the rich Imdad Khani and Vilayat Khani Gharana (style). In 2011, he was honoured by the Queen of England with a MBE award for his dedication to promote Indian classical music in the UK. Dharambir was born in prominent Namdari Sikh family and grew up in a strong musical atmosphere. His uncle Avtar Singh, a gifted Tabla player had a profound influence on his musical direction. Ustad Vilayat Khan Saheb generously provided access to the rich musical style of the Imdad Khani Gharana. Dharambir got immense love and guidance from the Ustad and as a result of his dedication and the blessings of Sri Satguru Jagjit Singh Ji, he was invited for Ganda Bandhan (traditional initiation ceremony) in Bombay in 1979. He has given many concerts throughout various states of Indian, including the Kamani Auditorium, Delhi; Birla Matushri Hall, Bombay and the Namdhari fest ivals in Delhi, Bombay and Lucknow. In 1974 he won the Sangeetayan All Indian Music Compet it ion prize for juniors and in 1977 he won the prize for the senior category. Dharambir Singh studied for his MA at the School Of Oriental and African studies at the University of London. He is very analytical and the combination of his academic profess and performance skill has given him an open mindedness and an unending desire to learn from all spheres of life. Dharambir Singh joined his parents in England in 1979 and has since settled in England. He has been active in performances and teaching in Europe. He has performed widely in major festivals in England, Spain, Germany and Italy. He has also performed in Canada and USA. He has worked extensively with the Euro Asian Fusion group Shiva Nova. He performs regularly in collaboration with musicians from other musical styles. Dharambir’s reputation as an educator is un paralleled in England. He started teaching for the Leicester Music service in 1983. He is currently employed by the Leeds College Of Music as a lecturer and the Artistic Director for Leeds Centre For Indian Music and Dance. The Leeds appointment has given him immense opportunity to train South Asian and Non Asian musicians. He has acquired a niche to teach Jazz musicians and as a result produced some prominent musicians who perform North Indian Music on Western Instruments. He has initiated numerous innovative projects across the country and is well known for the International Summer Schools in Indian Music. He has many students of Sitar all over the country and makes regular trips to other cities to teach.